"This Moroccan slow cooker dish is the perfect blend of sweetness and spice." Place the browned chicken and eggplant on the bottom of a slow cooker. Layer the onion, carrots, dried cranberries, and apricots over the chicken. Bring water to boil in a saucepan. Stir in couscous, and remove from heat. Cover, and let stand about 5 minutes, until liquid has been absorbed. Fluff with a fork. 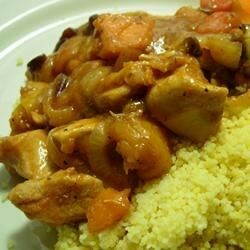 A wonderfully fragrant and gratifying Moroccan style dish. Interesting. My friends loved it...me not so much. But it was a concensus amongst us all that it needed more heat. Something to spice it up a bit. Probably won't make it again. This tastes great and is healthy with all the fruits and vegetables. I added a first layer of chopped sweet potatoes. Can't wait to make it again!